Please Make A Best Offer for Best Pricing! 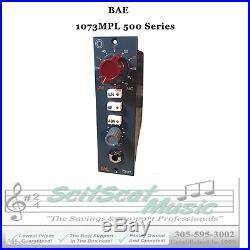 New BAE 1073MPL 500 Series Class A Microphone PreAmp & DI Hand Wired in USA. This is a Hand-Made Item. This is the 500 Series version of the 1073MP (a mic pre-amp version of the 1073 equaliser) having the same well-known characteristic Class A sound with its harmonically rich low end, slight resonant highs, and maintained focused mids. Two selectable impedances makes the 1073MPL work well with a variety of microphones. As a coloured and versatile mic-pre, the 1073MPL maintains its sonic signature across a wide bandwidth. All Class A, transformer-coupled design in a 500 series module. Input impedance selector switch between 1200 and 300 ohms. Line level capability for extra versatility as a line preamp. High impedance DI for guitar and synth. Same Carnhill St Ives transformers as the 1073 and 1084. Same modular design and hand-wiring BAE is known for. 10Hz to -3dB at 55kHz. Please Check with Your Local Government for More Details. We Will NOT Accept The Item Back For Return Without One. Real Musicians, Real Support, Real Knowledge, REALLY! Studio Production - Professional Musicians, Full Line Studio, Engineer on Staff. Training - Real Training in Pro-Audio & Studio Recording. _gsrx_vers_457 GS 6.3.2 (457). The item "New BAE 1073MPL 500 Series Class A Microphone PreAmp & DI Hand Wired in USA" is in sale since Monday, July 27, 2015. This item is in the category "Musical Instruments & Gear\Pro Audio Equipment\Preamps & Channel Strips". The seller is "scitscat" and is located in Key West, Florida. This item can be shipped worldwide.